A Car Floor Mat Made of Sisal Fiber is Best Used in a Dry Climate. Note: As of 19-Jan-2017 we have observed that IntroTech no longer manufactures and distributes this mat. Rather it is made and distributed by Designer Mat International, a company associated with IntroTech. This page has been preserved for historical reference purposes only. 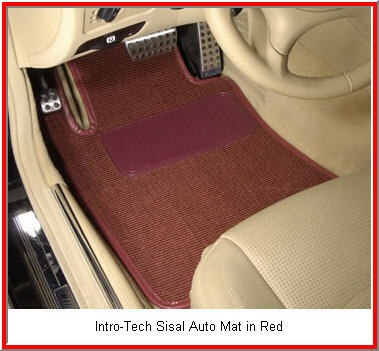 An Intro-Tech car floor mat made of sisal does a good job trapping dust and dirt. It’s made from imported Brazilian Sisal fibers which have been woven into yarn and made into an extremely tough and durable carpeting. A rubber nib or open cell foam backing prevents the mat from slipping on your vehicles floor and a sewn vinyl binding prevents the mat edges from unraveling. Sisal is a natural fiber made from the Agave plant, and very little, if any, fertilizer or pesticide is used in its cultivation. So this mat is the choice of you serious conservationists out there! Be warned, sisal absorbs moisture and expands or contracts as it does so. While a sisal mat is easy to clean when dry (just shake it out or beat it on a tree), it's harder to remove dirt when the mat is wet. So, it’s probably best to use sisal mats in a moderate to dry climate for best results. Tip: Keep your sisal mats clean and dry - use universal absorbent mat protectors. Keeping water, spills, gas, oil and other gunk off your sisal mats extends the life of the mats and makes you feel clean and good. It's also a lot easier to clean these absorbent mats than it is to clean a set of sisal mats.